In the previous post I touched on the fact that historically speaking, at least 200-300 troy ounces of platinum per year were produced from placer mines in Northern California, especially in Trinity County. I also mentioned the overall economic value of platinum group metals, including rhodium, ruthenium, palladium, iridium, and osmium as well as platinum itself. Now I'd like to get down to a few specifics about placer platinum in Northern California. I've already mentioned Trinity County but a number of locations in the Klamath Mountains in Siskiyou County can produce consistent, if not great amounts, of platinum "color" per sample as well. Most of the placer platinum found in both Trinity and Siskiyou Counties is a mix of what's known as ferrous or ferro-platinum. If you're up on your Periodic Table of the Elements you know that the Fe designation is iron. This means that the majority of platinum nuggets and smaller pieces found in Northern California are a mixture of platinum and iron, with the platinum content averaging around 80%-90% and the rest, of course, iron. 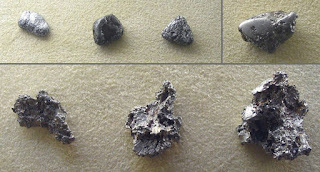 The average size for most of the larger ferro-platinum pieces recovered currently in the Klamaths and the Trinity area run in the 1/8"-1/4" range (measured side-to-side), but occasional chunkers of 1/2" or larger can be found. Geologists believe that Northern California's platinum-bearing gravels are associated with what are termed "Cretaceous Period conglomerates." These gravels are typically found in a geological environment known as a melange which is composed of large blocks of altered rock from ancient sea floor sediments. 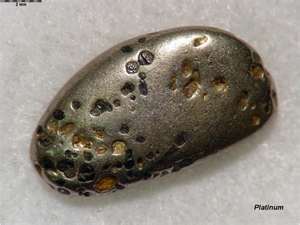 Another important geologic clue to locating areas that may contain alluvial (stream) platinum is the presence of serpentine bedrock formations, something that can be relatively common in select areas of the Motherlode Region and the Trinity and Siskiyou ranges. So, speaking very simplistically, find an area containing Cretaceous Period conglomerates along with melange and serpentine and you may well be in the platinum business my friend! If you liked this post, you may want to read: "Alaska Still a Big Gold Draw"